To ensure continuing process capability a scheduled programme of servicing / maintenance is operational within Weld-A-Rail. Scheduled servicing / maintenance of equipment, having a direct effect on product quality, is undertaken by Weld-A-Rail’s sister company Rail Plant. Rail Plant operate at the leading edge of technology in respect of equipment maintenance / servicing, repair and calibration. Digital systems have been developed for all associated activities including gas equipment and straight edge calibration and are fully operational. All servicing is controlled through a unique servicing database “Service Desk”. time of 8-24 hours with no geographical limits. The company operates a fleet of 17 fully equipped welding vehicles. Porosity or cracks on the contour of the head of weld. In addition, the relevant competency and experience exists within Weld-A-Rail should it be required and appropriate, to undertake a complete inspection of Alumino Thermic welds cast. Copies of the Weld Installation Sheet are forwarded to the customer within five working days of the weld being cast. 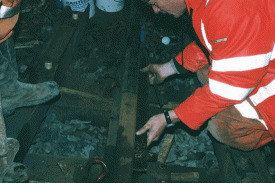 Records are maintained by Weld-A-Rail of all completed welds to facilitate complete traceability. Failed welds are identified and analyzed with corrective and preventative action taken to ensure the best quality can be achieved and the elimination of future failures. Subsequent to the work being completed the customer will undertake an independent inspection of the welds completed by the company and advise of any defects identified. necessary corrective action in accordance with WQP102 Control of Corrective and Preventative Action.